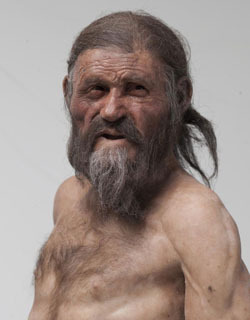 The Iceman mummy, also known as Otzi, is about 5,300 years old. Scientists studying his body since his discovery in the Italian Alps in 1991 have learned many things, including the cause of his death (an arrow to the back) and his last meal (ibex meat). An analysis of the corpse’s chemical composition suggested that he was born and lived his entire life in the Tyrol area where his body was found. Now they’re delving deeper to unearth more clues in the mummy’s DNA. On Feb. 28, European and American scientists, including Stanford School of Medicine genetics professor Carlos Bustamante, PhD, and senior research associate Peter Underhill, PhD, announced the sequencing of Otzi’s entire genome. It is the oldest human sample to undergo such an analysis. Postdoctoral scholars Andres Moreno-Estrada, PhD; Brenna Henn, PhD; and Martin Sikora, PhD, also worked on the study, which appeared in Nature Communications. High-throughput DNA sequencing was performed at Massachusetts-based Life Technologies Corp.
Sardinia is the second-largest island in the Mediterranean Sea. It lies 120 miles west of Italy’s mainland and 7.5 miles south of the French island of Corsica. Obtaining and sequencing DNA from such an ancient source was challenging. “Ancient DNA, which has been exposed to the elements for thousands of years, is plagued by contamination both from the environment and anyone who has handled Otzi since his discovery,” said Timothy Harkins, PhD, of Life Technologies who led the sequencing effort. To limit contamination, researchers used a long needle to tap the inner part of the femur. As it was, the researchers obtained only about 20 nanograms of genomic DNA for sequencing, which is hundreds of times less than the amount usually used for whole-genome sequencing of modern-day samples. From this, the scientists were able to identify about 2 million unique sequence variants for population studies. One small variation on the Y chromosome pointed researchers to Otzi’s island heritage. The finding suggests two scenarios: either the mummy’s ancestors were once more prevalent in mainland Europe than they are now (and some unknown selection process caused them to die off everywhere but the island strongholds), or they actively immigrated to the mainland from the island. Because there is little archeological evidence of the large, rapid population change required in the first possibility, the Stanford researchers favor the second. “It’s thought that Sardinia was first peopled about 11,000 years ago by sedentary hunter-gatherers,” said Underhill. “Some samples of volcanic glass, or obsidian, found in mainland Italy and southern France have been shown to come from Mount Arci in Sardinia. This implies that there were episodes of trading between the island and mainland.” If so, the mummy’s ancestors could have arrived in Europe as traders. In addition to indicating Otzi’s ancestry, the analysis also suggested that the man suffered from a modern malady: Lyme disease. Traces of the DNA of the bacteria that causes Lyme disease were found in the mummy’s bone marrow. It’s the earliest documented case of Lyme disease in humans. The research was supported by the National Geographic Society, Südtiroler Sparkasse, Foundation HOMFOR, the D.F.G., the Minigraduierten-Kolleg Tübingen, the DAAD/GERLS, the National Institutes of Health, and the National Science Foundation.